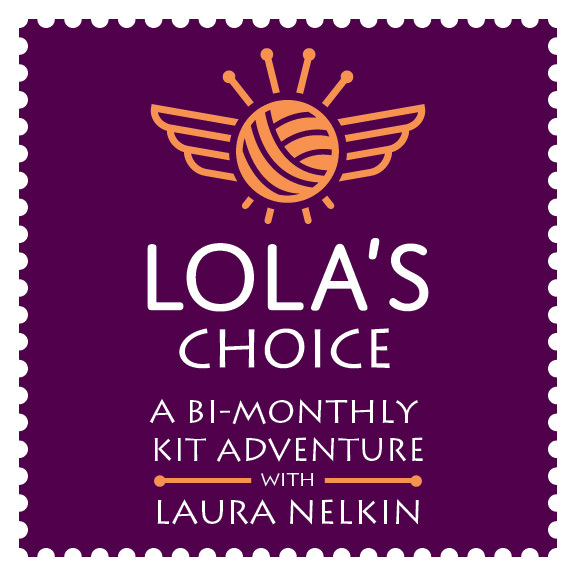 My jewelry & accessory kits are FAST and FUN to knit, and there is still time to receive them and knit them for the holidays! They are also fabulous gifts for knitters as is... if you have a knitting relative, friend, teacher, helper, or loved one you can wrap one up for them without even knitting it!!!!!! So, while supplies last or until Tuesday December 2nd at 12 pm EST, I am having a 30% off sale on everything in my Etsy shop. Just enter the coupon code HUGETHANKS14... there might even be some signed copies of Knockout Knits in there as well : )! 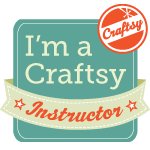 Also, I should let you know that Craftsy is having a huge sale too and all classes are $19.99 or less! This includes all 4 of my knitting classes with them! THANKYOU FOR ANOTHER AMAZING YEAR!!!!! Winners... and a heads up! I know it's not traditional, but we aren't big meat eaters so I've never taken to making a turkey which is rather freeing when it comes to Thanksgiving menu planning! The salmon will be served with fresh cranberry relish, the gnocchi will get a wild mushroom sauce, there will be shaved brussel sprouts (my fav!) for a veg and we'll top it off with Miss B's pumpkin pie! Over the weekend we made these rolls and my girl and honey were discussing how amazing they would be stuffed with chocolate and topped with cinnamon sugar.... so those might be added to the desert menu, or maybe for breakfast? First up, the winner of Hunter Hammerson's new book Curls (which I reviewed last week) is Goodstuff. 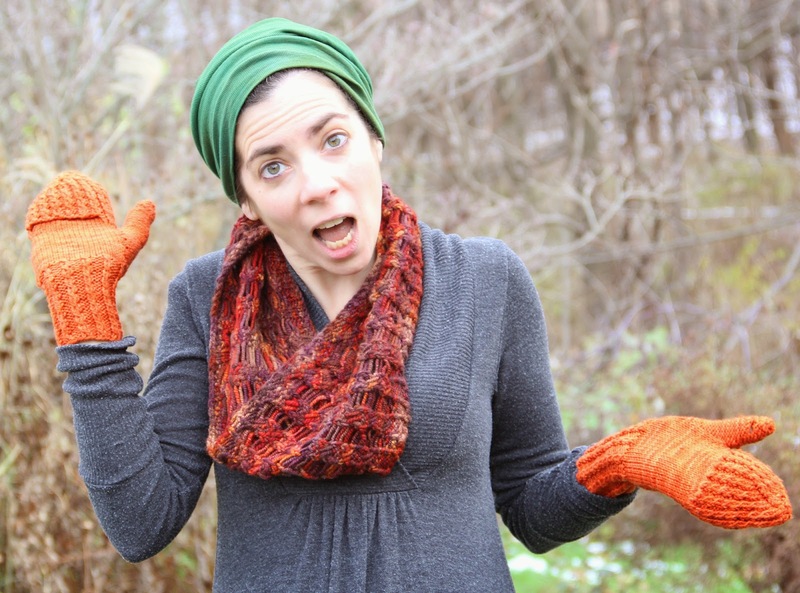 Congrats go to Thecatisfelting for her stunning Michigan Magmatic BOOM in Fiber Optic Swamp Muck... I love how you chose your bead colors to gradiate (is that a word?) in the other direction! Karen and Brenda get in touch with me to claim your prizes! Congrats! In case any of you are in the New Jersey region, I just announced TWO new events the weekend of December 5th! 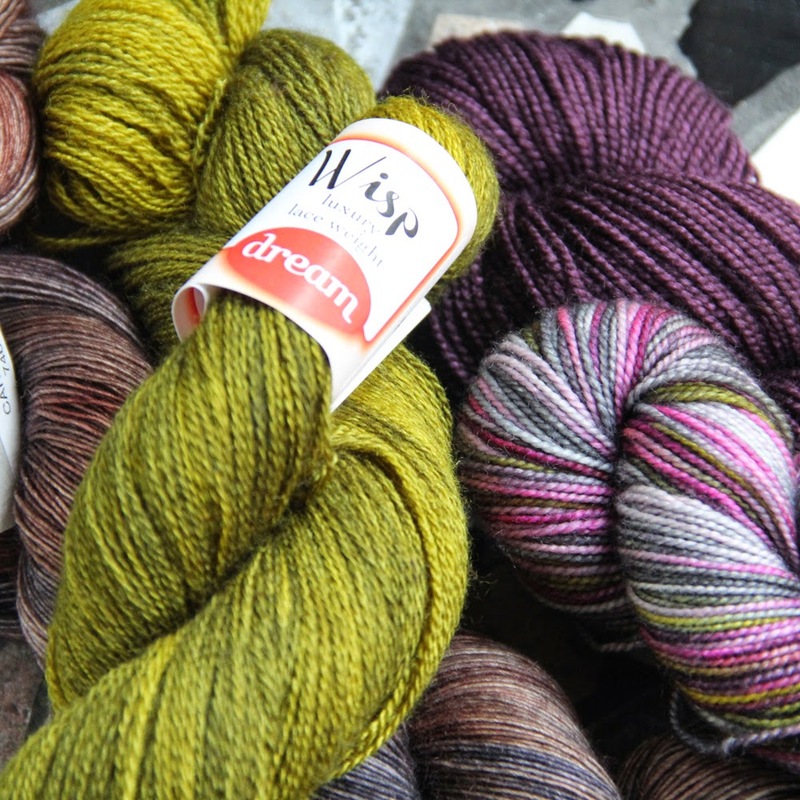 I'll be at Chelsea Yarns on Dec 5th and 6th, and at Close Knit on December 7th. I can't wait to see Chelsea for the first time (I've heard it's GREAT!) and see Close Knit's new location! Oh, and keep an eye on the blog Thursday night... 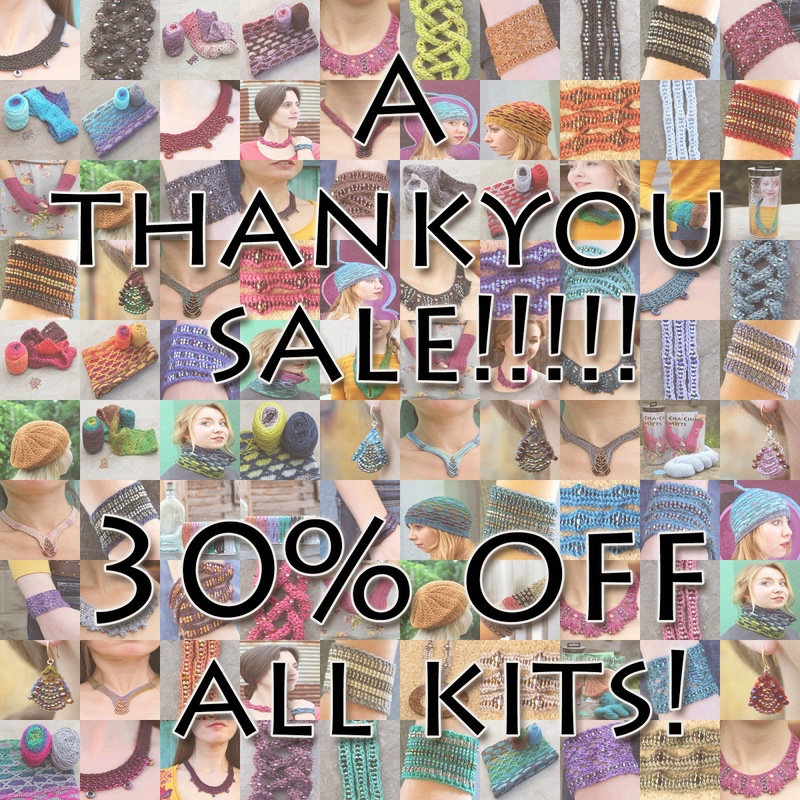 I'll be announcing a kind sorta big sale in my Etsy shop as a Thankyou for helping support me through this super fun, crazypants year (plus a Craftsy sale as well). I'm off to exercise... I'm trying to be proactive about the weekend's eating activities! 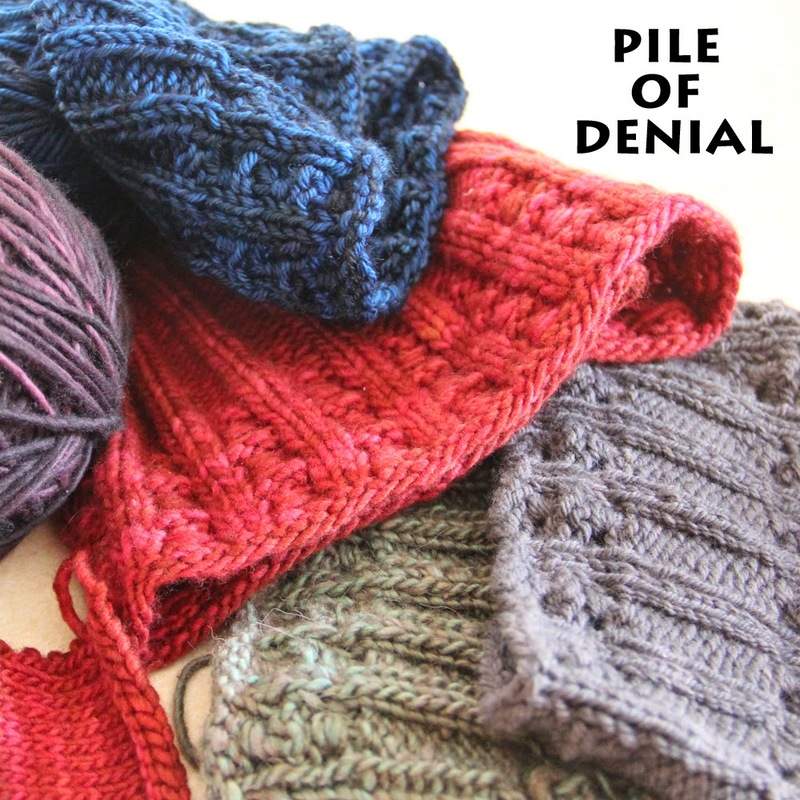 So, I've had a little yarn schooling this week.... it started with (a bit of) denial, a bunch of knitting, and finally a late night chat with a friend set me straight. Ready for a story? I decided I wanted to knit a hat and headband to match the Hay Bale Mitts I designed for Craftsy's November Mystery KAL. 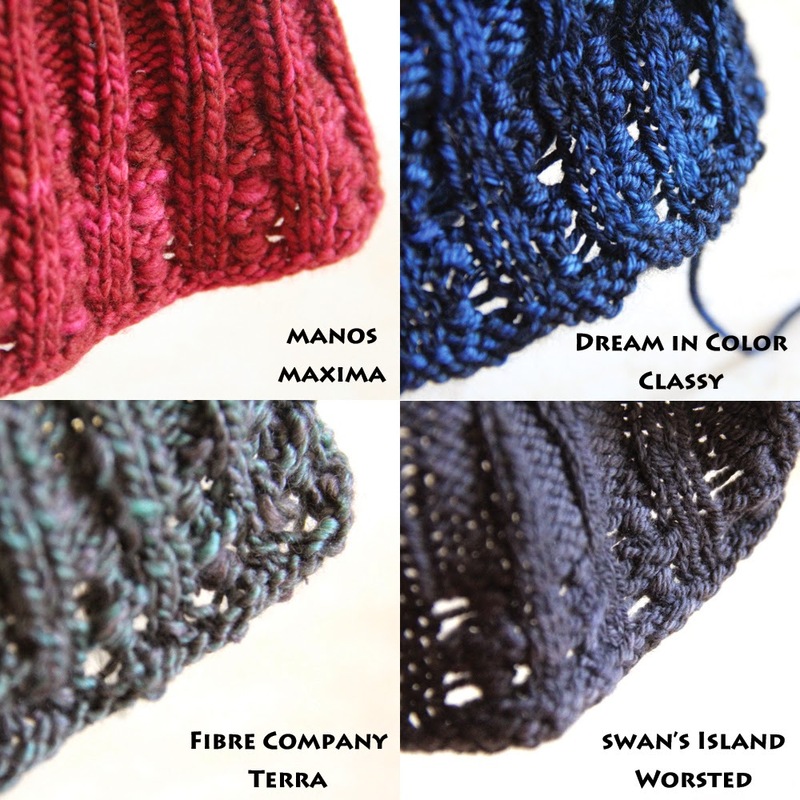 So, while I was traveling last weekend I got a skein of Manos Maxima for the hat and a skein of Fibre Company Terra for the headband... which had similar yards/weight and then I knit them. I knew the Terra was a little bit heavier, but the Manos is thick due to it's single ply and they seemed like a good match. I LOVE the hat, but the headband wasn't quite right, the stitch was getting lost in the textural quality of the Terra so I solved the problem by going to Knitting Etc on Sunday to BUY MORE YARN. I went with my girl, and she "ordered" a Hay Bale Hat for herself, so we got a skein of Dream in Color Classy. This is the yarn I used for Cruzado Cowl... love it! It has the same yardage/weight as Maxima, so I assumed I was good to go. Before I cast that on I knit ANOTHER headband in Swan's Island Merino (admittedly, this was more like 250 yards/100grams). I was in denial.... right? BUT, I'm obviously dense, and also really like to knit so instead of halting and looking at the fabric I kept knitting. Then without stopping to think, I wound up B's yarn, and cast on her hat. 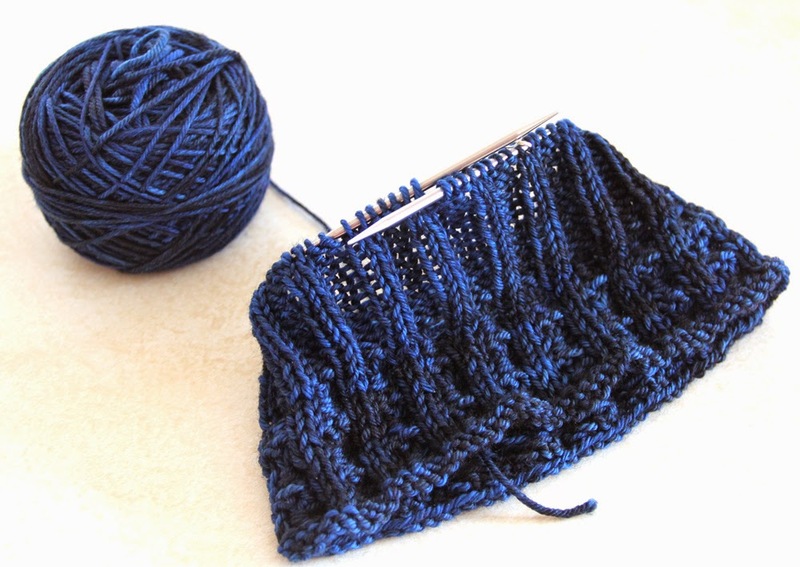 I need you to know that I did do a gauge swatch and it was pretty close... but look, it's loosely goosey and NOT at all squishy like the Maxima hat... I'm not happy with it at all! How can this make sense? Two yarns with the same gauge, yardage and weight and they don't act the same in the design? NOT FAIR! Last night at knit night Hickory helped me figure the dilemma out and saved me from more mistakes. Here's the thing, the Manos Maxima is a single ply and that gives it loft that fills in the space between stitches beautifully and helps accentuate the Hay Bale stitch. The Classy and Swan's Island are 4-ply and more tightly spun and the stitch just doesn't show up.... AT.ALL! I don't typically choose single ply yarns as they don't wear as well as plied yarns, but in this case I'm breaking my own rule! #1. 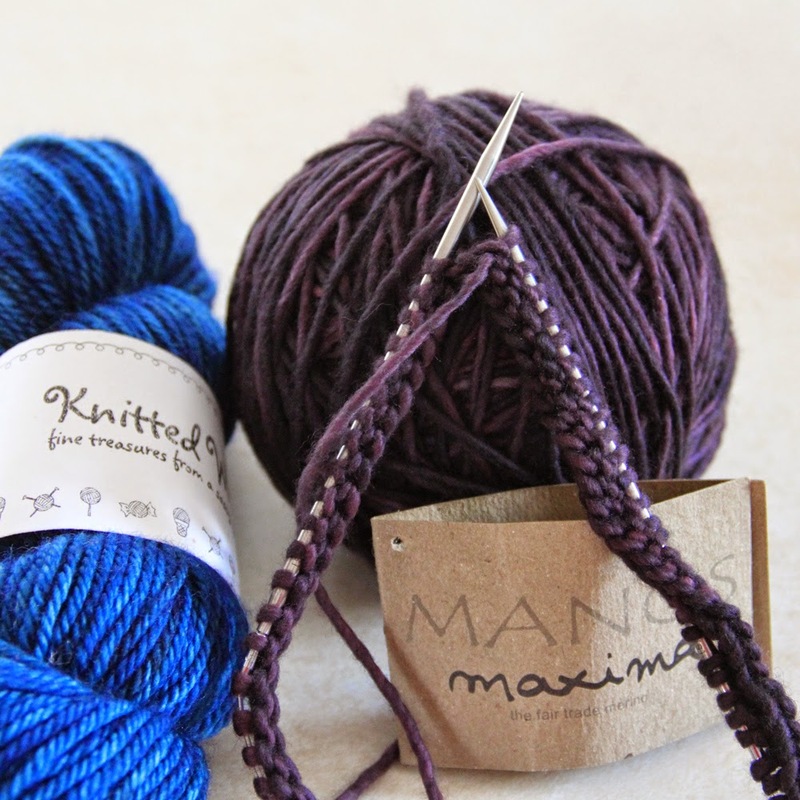 Get another skein of Maxima for the headband! #3. 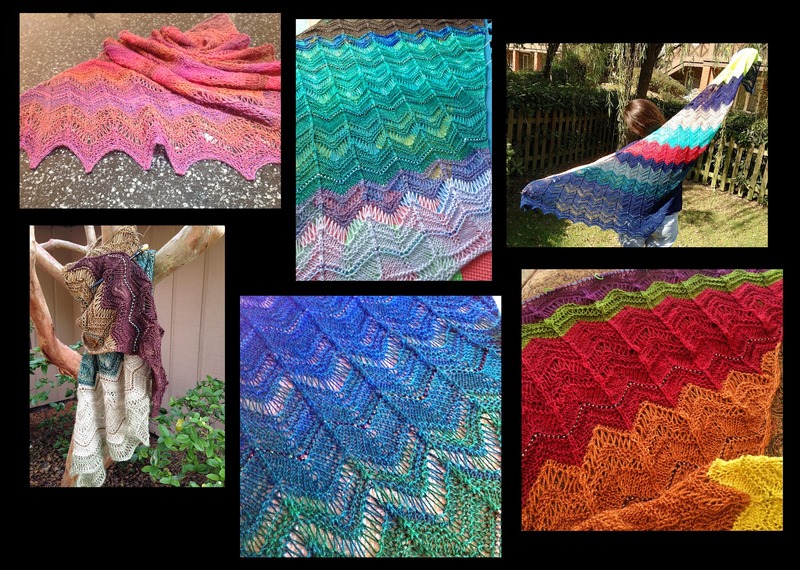 And Hickory's idea (which is obviously brilliant): Buy 4 more skeins of the Dream in Color Classy in Peacock Shadow and knit a sweater! Cause that yarn is nice and I already have one skein, right? I took care of #1 and 2 last night...... 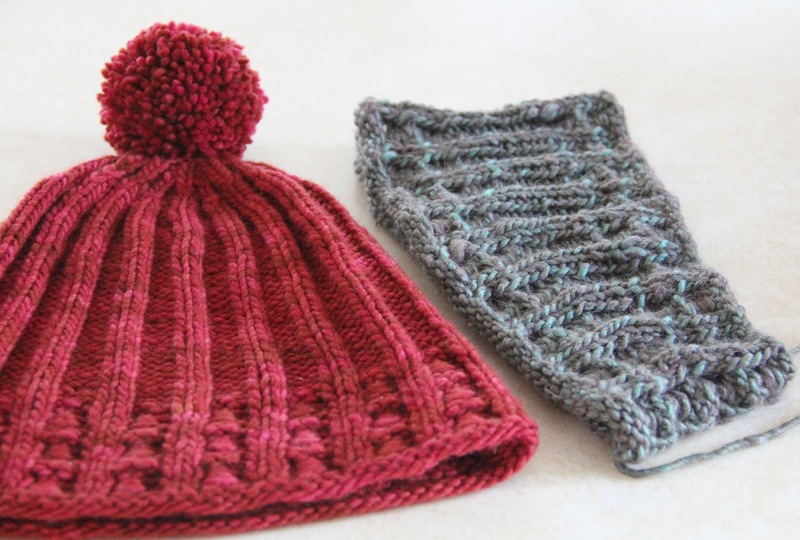 I just have to knit another headband (cast on above), another hat, and do some photography and the Hay Bale Hat and Headband will be ready for your knitting pleasure! But at least you won't make the same yarn mistake(s) I did! First off, there is something about Curls that is irresistible... it dives deep into one particular construction (or rather increase solution) that creates a curl. 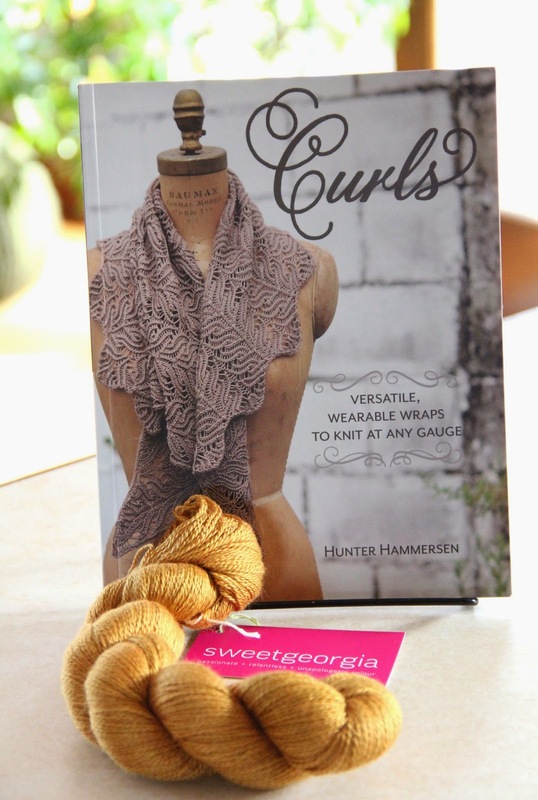 These curls can be made in any size, any weight yarn and easily translate into intricate lace patterns. The book begins with simpler stitches for the first curls and works up to more advanced stitches as the book progresses. All in all there are 14 Curl designs to choose from. I've had a little obsession with boomerang shaping lately, and I spent some time this afternoon discovering the difference between a curl and a boomerang. In a curl all the increases happen on one edge (sometimes on the right side and sometimes on the right and wrong sides, depending on the design) and the other edge is worked straight. 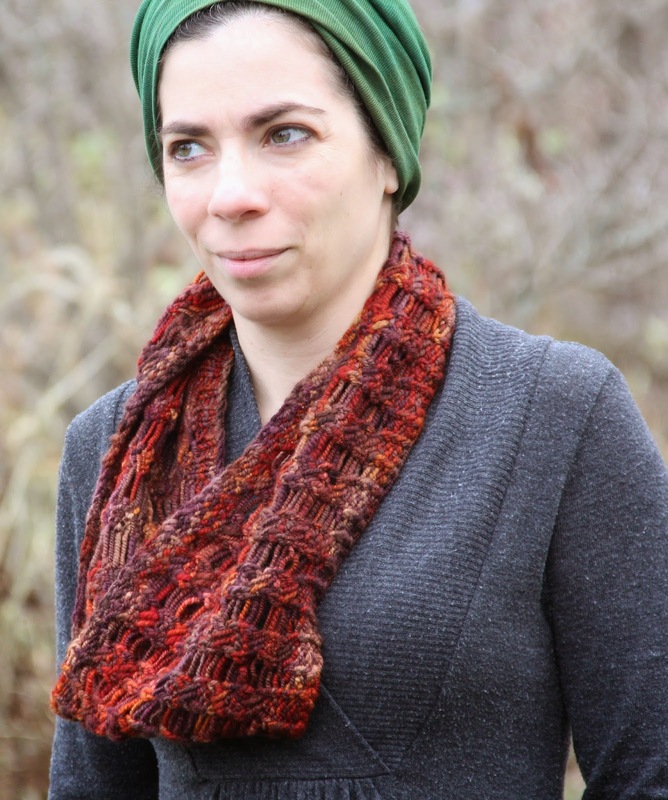 In a boomerang shaped shawl, increases happen on both the right and wrong sides of one edge, and a decrease happens on only one side of the other edge which causes the shawl to tilt as it is knit but not have a curl to it. I adore the time Hunter spends helping you understand the anatomy of a Curl and how her stitch patterns fit into them. 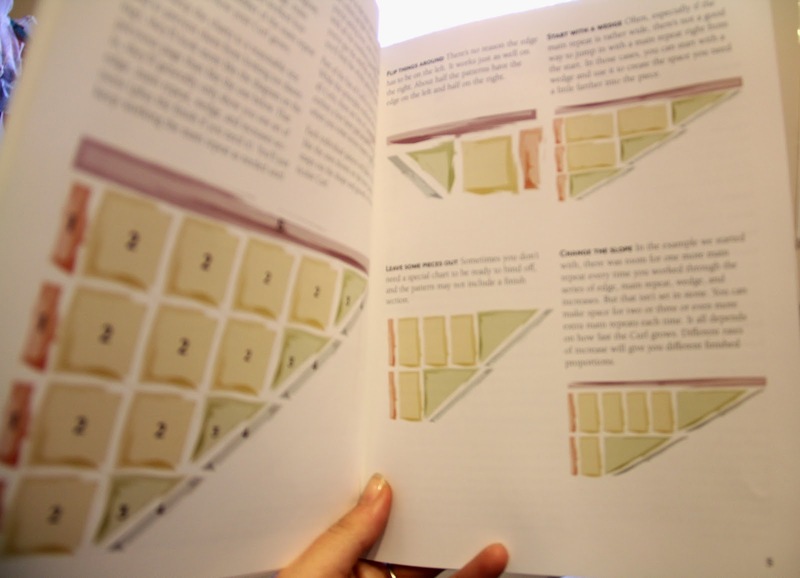 Every pattern has a diagram of how the construction works for that particular design and the anatomy section at the beginning of the book helps you translate this for the design you choose to knit! And guess what? I've got a printed copy of Curls for one winner, along with a skein of Sweet Georgia CashSilk Lace in Ginger from stash which I think would be perfect for a laceweight Curl!!!!! Who wants a chance to own this set? Just leave a comment letting me know which curl you are most drawn to knitting first. You can see them all listed on Ravelry here. Don't forget to leave a way to get in touch with you. I'll leave comments open until November 25th at noon EST and then randomly choose a winner! Ever since I knit Crux Cowl for Knockout Knits I knew I wanted to knit another for myself... this summer I was in Taos New Mexico and fell in love with a skein of Widdershin Woolworks handspun BFL/silk yarn at Mooncat Fiber. 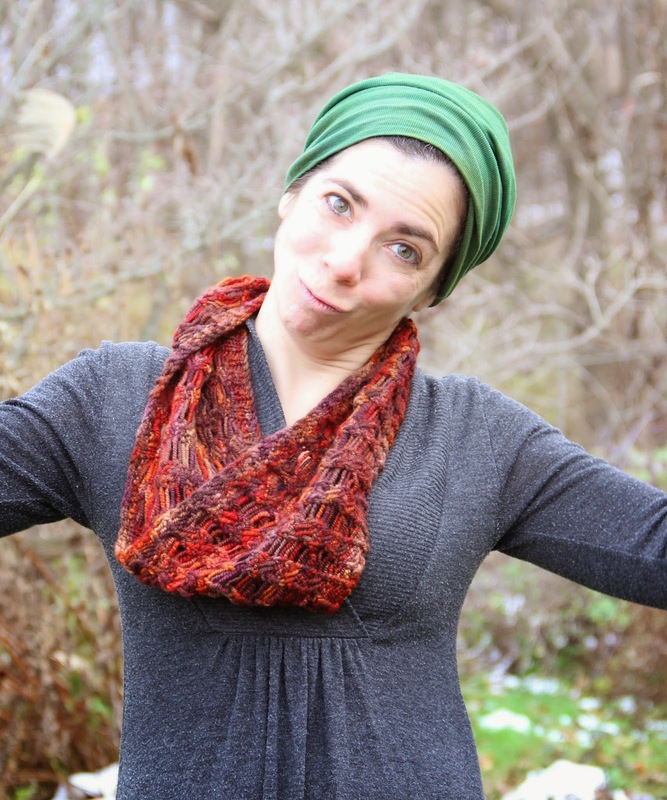 It was a worsted weight and only 130 yards, but I knew it would be perfect to show you how versatile the Crux Cowl pattern is! Also, I knew that Crux Cowl could be confusing some people as on your needles, it does not look like it does in the photos in the book! This is because you are working columns of 4 stitches that have a stitch in between them that is dropped creating a long horizontal float. This dropped stitch does not unravel the stitches next to it as they are either worked through the back loop or as part of a criss-cross stich, that locks them into place. 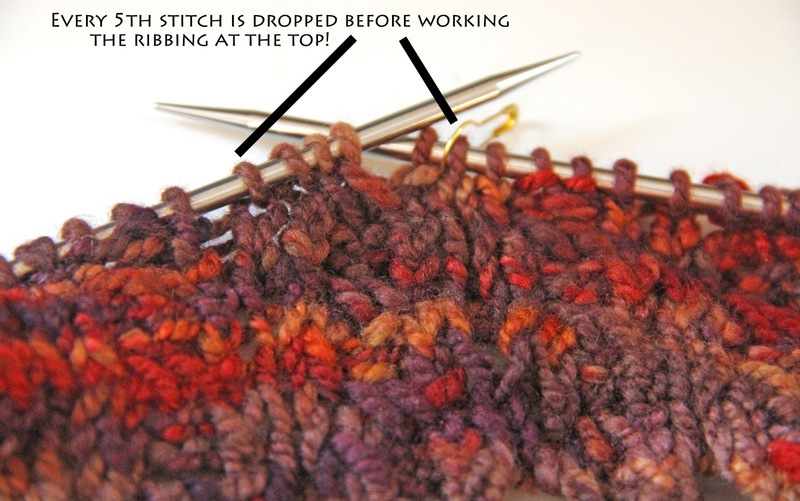 And, that stitch isn't dropped until you have worked the whole cowl... hence the confusion! It was easy to adjust this pattern for a smaller amount of yarn. First I weighed my ball of yarn with my handy dandy digital scale (if I was a good blogger I'd have a photo of this step), then I cast on the larger size, and worked the ribbing as written. I then weighed my ball again and subtracted that weight from the first weight; this is the amount I needed left over to finish the ribbing at the end. I jumped into working the 4 round pattern, checking the weight on my ball as it got smaller. 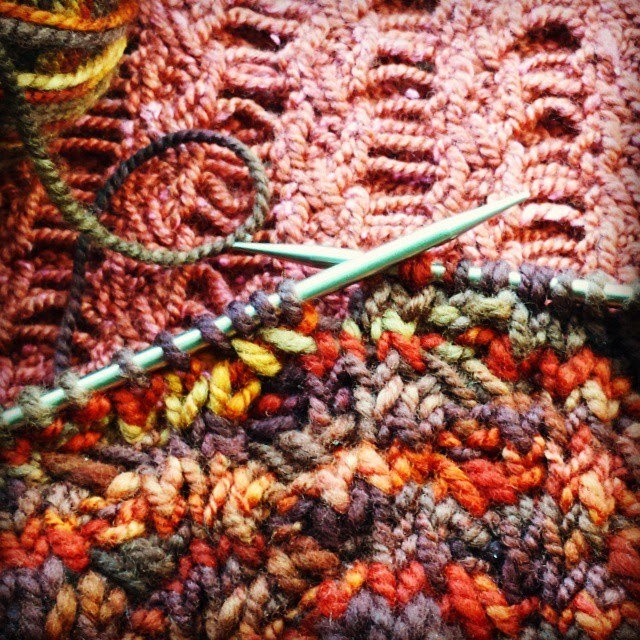 When it weighed close to the same amount as for the ribbing, I discontinued the stitch, dropped the stitches (SO FUN!) and worked the ribbing before binding off. Easy! And then once it was done... I convinced the girl to take some photos of me attempting to be super super serious.... thanks Miss B you can really catch the essence of your Ma! Time for a Nautical Knitting Cruise! So, whatcha doing Dec 5th- 10th, 2015? 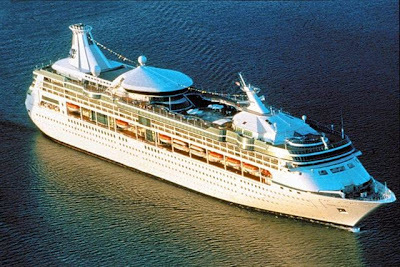 Nautical Knitting takes place on Royal Caribbean’s beautiful Brilliance of the Seas and departs from Tampa, Florida on Dec 5th, 2015. 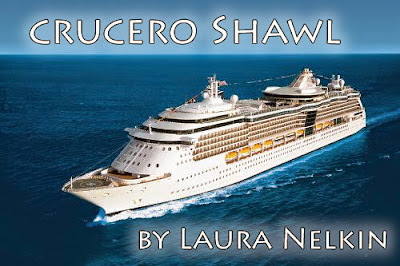 It is bound for Key West and Cozumel... the class schedule is amazing! 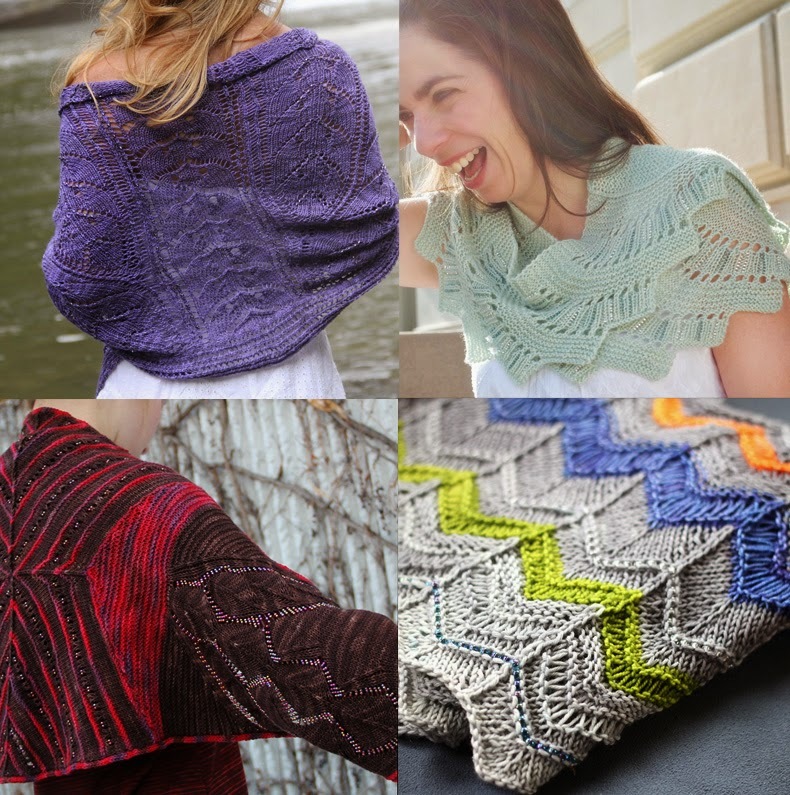 I'm teaching some new classes AND designing a shawl just for the event! I'm already searching for the perfect yarn for it! Or maybe I should design that bikini y'all have been asking for? You can see boat information class schedule, fees, and sign up info here. You can either pay via credit card on-line or print out the registration and send it in with a check. It is necessary to book your room on the cruise through Joel (see link above) at the same time to be part of the group. 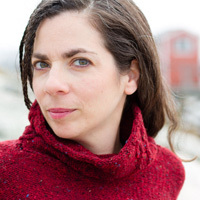 I've set up a thread in my Ravelry group so we can get the party started! I have some ideas for evening events that are going to be humorous! This is going to be SUCH A BLAST! Who is in? Don't miss out.... next year's M Club is going to be amazing... the exclusive yarns and patterns I have in store for the club are unbelievable... keeping secrets this big is HARD! Last year's M Club was phenomenal; tons of fun and learning was had by all. Julie, one of last year's members, summed up all that was learned perfectly here. Enrollment closes on Nov 10th, or when we fill up, whichever comes first. So, sign up here! I have added a deposit option for those that who would prefer it. Please e-mail me for details.